Every January my email is filled with different programs promising to make this year “The Best Year Ever”. I’ve found the easiest way to make ANY year the best it can be is to optimize the amount of time I spend enjoying each day. If you’ve started off the New Year with a list of resolutions which only last for 2 weeks, spend this year focusing not on doing more but on enjoying more. 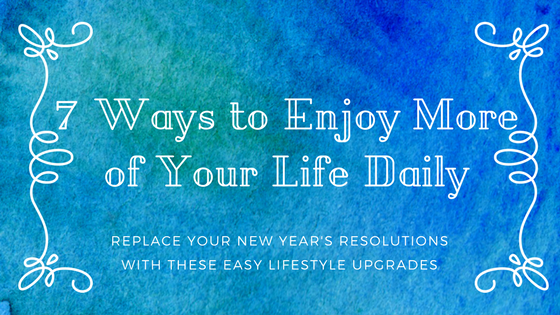 Below are easy ways you can upgrade your life in 2018 by actively getting more of each of the seven types of rest I discuss in my book Sacred Rest. Make this year the best by learning how rest can restore every area of your life. Emotional Rest – Stop worrying about what other people think. The time and energy spent in this area are best used to build relationships with people you enjoy and who enjoy you. Physical Rest – Rediscover the joy of using your body for something other than work. If you’ve completely forgotten, spend some time watching a young child play. The freedom found in play is as needed in adulthood as in childhood, some would even argue more so. Don’t let responsibilities edge out the liberty to enjoy something just because it makes you smile. Sensory Rest – Unplug from the endless flux of sensory input around you. Determine what noises, smells, sights cause you to feel anxious or irritable during the day. Eliminate as much of these sensory stimuli as possible. Dim your computer screen or the lights in your office. Use earplugs to quiet your surroundings. Make the needed interventions to take back control over what goes into your body via your senses. Mental Rest – Refuse to allow your mind to dwell on the negative. The mind always wants to go down the path of least resistance. Instead of letting it pull you down that path, put up instant roadblocks and redirect your thoughts back to things which cause you to feel happy and hopeful. Even in the midst of difficult situations, an optimistic perspective can help you to breakthrough into better days. Social Rest – Purposefully connect with people who increase your capacity to love boldly, laugh openly, or live fully. These people will help remind you to live in the moment and will happily bring you into their moments. Spiritual Rest –Determine what you believe about God and why you believe what you do. If your beliefs are based on family traditions, risk exploring truth for yourself. Seek out your own spiritual journey to determine who God is to you. Open up the pages of the Bible and walk through each story as one seeking not to simply learn but to encounter God in the pages. Creative Rest – When the last time you were awestruck? Awe and wonder should be a regular part of your life. They keep you open to experience and enjoy the beauty present in your day. They create an expectation of goodness. They move you from existing to enjoying.